It’s a humid July night, and 6-year-old Wyatt Garab is relaxing on his living room floor while playing on his iPad. His mom, Courtney Garab, is nursing her 3-week-old baby, Corbin, on the couch; while Sawyer, the family’s middle child, is happily next to her. And Wyatt’s dad, Grant Garab, a staff sergeant in the Marine Corps, is relishing the Thursday night off of duty with his family. It’s 6 p.m. When the air cooled, they were all supposed to go to the park. But, without warning Wyatt jumps up clutching the right side of his head. Figuring the pain is related to a migraine, his dad administered some Tylenol and suggested bringing Wyatt upstairs to rest. The whole ordeal seemed strange, though, out of the blue. Wyatt hadn’t had a migraine before. And when Wyatt couldn’t even walk up the stairs on his own, both Courtney and Grant found reason to believe something more may be happening. The pain, Courtney Garab described, struck Wyatt that night in spurts. It would go then come back again and with vengeance. Even once Wyatt was tucked into bed with the lights out the spasms showed no mercy. “Try to calm down,” his dad said, trying to soothe his son. And then Wyatt responded in the most unusual way, uttering a sentence that made no sense at all. “I can’t calm down, you won’t sing me a lullaby,” he said. It wasn’t long after those words that Wyatt began to projectile vomit. Their quiet mid-summer’s night had officially turned into a real-time nightmare. The EMTs (along with two police officers) arrived just as Wyatt began to foam at the mouth while his left side went completely limp. The family would split up — Grant would ride along in the ambulance while Courtney would gather what she could for the children and meet them at the Onslow Memorial Hospital. Inside the ambulance, Wyatt’s condition rapidly worsened. His dad assisted with prying Wyatt’s mouth wide open as he simultaneously seized and vomited. Once Courtney pulled into the parking lot, Grant approached and told her to sit back down. Doctors discovered Wyatt’s brain was bleeding. This would be the first time the Garab family would hear the term aneurysm applied to their son. And then, she said, the thought no parent ever wants to ponder entered her heart: Will I be that parent who loses a child? Seconds felt like minutes. Minutes felt like hours. Hours felt like days. Both Grant and Courtney mulled over their family history. There was no record of anyone on either sides ever having a brain aneurysm or even brain tumors. Admittedly, they both knew nothing about brain aneurysms as a whole. They mistakenly assumed what so many of others do: It happens only to adults. But, children? Is it possible? And they traced over Wyatt’s activities: He didn’t fall and hurt his head. He didn’t suffer any prior injuries. Nor was he diagnosed with any disorders — all things that could have led to a cranial bleed. To them, none of it made sense. And all of it made them question what exactly a brain aneurysm is. How is it caused? As WebMD describes it, an aneurysm begins with a bloated, weak area in the wall of an artery that supplies blood to the brain. Many times, a brain aneurysm causes no symptoms at all and thus goes unnoticed; but in other rare cases, the brain aneurysm will rupture, freeing blood into the skull and triggering a stroke. The result is called a subarachnoid hemorrhage. The most common place for brain aneurysms is at the base of the brain in the network of blood vessels, called the circle of Willis. According to the Department of Neurosurgery at Columbia University Medical Center, these brain aneurysms are more commonly found in individuals through their 40s or 50s. But there are also even rarer conditions where they can occur in children without absolute explanation. The Department of Neurosurgery at Columbia University had more to say about pediatric brain aneurysms on their website. There is upwards of a 50-percent death rate in those with a ruptured aneurysm. 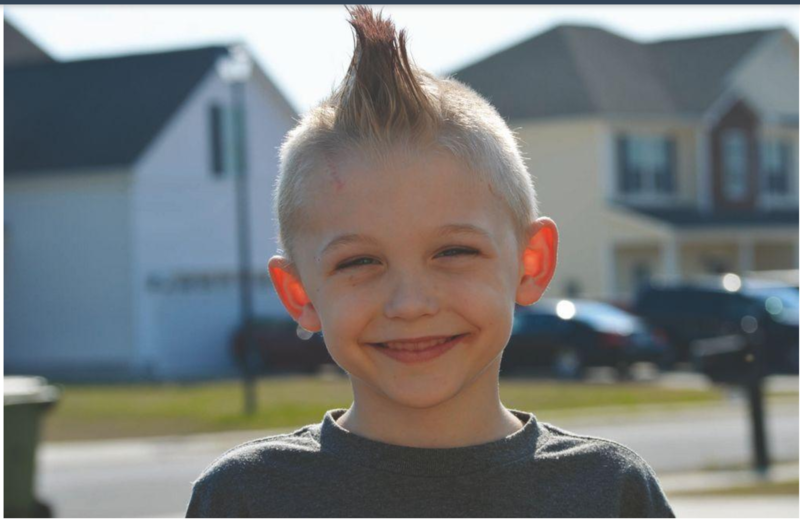 In Wyatt’s case, he also developed a blood clot along with his ruptured aneurysm. It compounded matters, but also seemed to buy him a bit more time. In Greenville, both Grant and Courtney waited for 40 minutes inside a conference room for doctors to speak to them. “I broke down. I prayed, literally begged for Wyatt to be OK,” Courtney remembered. Her voice pausing for a moment, maybe struggling, to keep an unmoved tone in front of her children. She’s told this story numerous times, so it’s OK, she assures me.